While traveling around the world recently to discuss social business in Asia and Eastern Europe, I’ve been reminded by the sheer speed at which social networks are changing how we communicate. Most of the Western world has been on social networks for a while but now the rest isn’t far behind. However it’s people like you and me, sometimes referred to as consumers by the business world, that have been leading this particular technology and societal revolution. Consequently, it’s been taking longer for those in the enterprise to sort out how the “Corporate Spring” will affect them. I’ve written about the concerns over ROI as organizations try to figure out their appropriate level of investment in social media, internally on intranets and externally for social marketing, customer care, and product development. Australia has been interesting case in particular, and one in which I was fortunate enough to visit for the first time last year when I spoke at Social Business Summit 2011 Sydney. Australia has been listed most recently — along with other highly developed countries such as the U.S., the U.K., France, and Germany — as “social mainstream and mature” by the Boston Consulting Group. 90% of Australians use social networks, ahead of other advanced countries, such as Canada. Facebook usage exceeds 50% of those using social networks. As in other countries, Australian businesses are now catching up now that their customers and workers have change their communication habits and behaviors. The same report I cite above says that 77% of organizations in Australia expect to increase investment in this social media over the next 12 months. But the fundamental question is, given the many directions that social media can take, how best to architect social media into the way a business works? 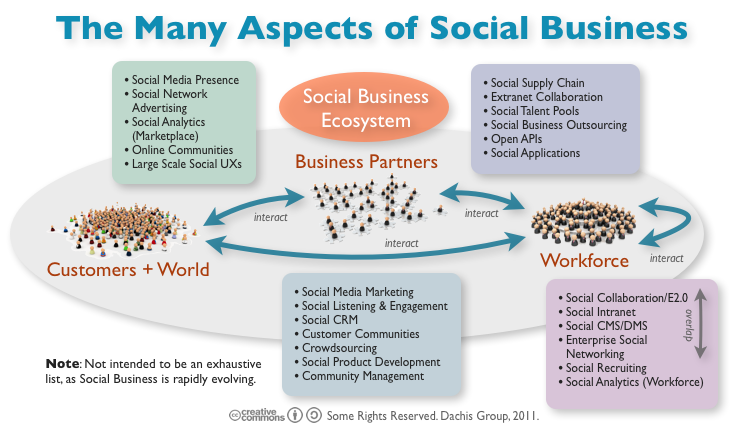 How can social business best be situated in the way that organizations work to derive value that really moves the needle? To help answer that, I’m pleased to report that I’ll be kicking off the book tour for our new book, Social Business By Design, in Australia with a series of appearances in Sydney later this month, from May 14th-18th. In addition to speaking at Intranets2012, I’ll be giving two workshops that are being exclusively sponsored by Headshift Australia. Details are below as well as here. I genuinely hope to see you if you’re in Sydney or surroundings so that we can continue the discussion and explore of the future of how organizations will operate and create value for themselves, their customers, and shareholders. The social media era has arrived and organisations are looking for ways to grapple with the many implications to their business. Companies are increasingly seeing the benefit and need to approach social media activities with integrated external and internal efforts. Professionals can no longer rely on point solutions and isolated activities — no brand, department, or employee is an island in the social landscape. Today, firms can learn from the lessons of early adopters and craft a solid plan for success that includes formulating a winning strategy, applying appropriate game-time tactics, and measuring for meaningful return on investment. This session provides a cohesive and readily approachable introduction to social business that is immediately actionable by executives, line managers, and workers. Who should attend: This workshop will be relevant to people working in different management roles, including sales & marketing, customer service, HR and operations. Where: Headshift Asia Pacific, East Sydney. Cost: $275 (excl. GST) per person (includes a signed copy of the book). Tea, coffee and light refreshments will be provided. To book this workshop, please use our online registration and payment page here. Please note, that places are strictly limited. Employees have begun driving the use of consumer technology in the workplace—bringing their mobile devices, Web apps, and social networking experience with them from home—but the trend goes even deeper than that. It’s a fundamental shift away from IT creating and managing the organisation’s IT assets to accepting that employees now own significant swaths of technology and will lead the enterprise march into the future. Dion has watched organisations large and small struggle with this convergence of mobile, social, cloud and big data, and has helped them prevail in their quest to harness it for innovation to transform the way the enterprise does business. Dion will explore the new IT landscape and share his consumerisation experiences in the field to set the stage for consumerisation in your organisation by showcasing real-world companies that represent the new generation of IT and business. Participants will be equipped with strategies that will enable them to take steps towards managing the trends and keeping ahead of current trends. Who should attend: This workshop will be relevant to people working in different management roles, including sales & marketing, IT, customer service, HR and operations.